Sage Sustainable Electronics’ GoodTogether program helps businesses donate refurbished technology to the 14th Street Community Center in Portsmouth. Every modern business has surplus technology. But few routinely put their used tech in the hands of those in need. 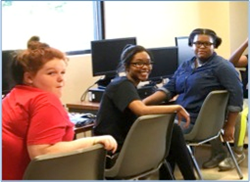 Sage Sustainable Electronics, Charles Schwab & Co., Inc, Huntington National Bank and Connect Ohio have banded together to bring desperately needed IT devices to the 14th Street Community Center in Portsmouth, OH. The Center has played an important role in the City of Portsmouth for over 75 years. The original building was built by members of the African American community on land given to the Black Churches in 1942 by the City of Portsmouth, at a time when elementary schools, public housing and public recreation facilities were segregated. In the early 2000s, the original Center building was torn down and replaced. Today, the Center is one of the most racially-integrated institutions in the county. It serves over 120 individuals each week, ninety percent of whom live below the poverty level. The Center provides after-school tutors, athletic and arts programs, entrepreneurial skills training, cooking classes and community dinners, a self-esteem program for youth, as well as programs and speakers from various disciplines at Shawnee State and O.U. Ironton. Each year, the Center distributes Christmas gifts to all children in the Farley Square neighborhood, regardless of race or religion. Unfortunately, up until recently, the Center was struggling technologically; only 1 of its 20 computers was in working order. Meanwhile, the demand for technology at the Center was growing daily. “The vast majority of the young people who come to the Center do not have computers at home,” said Orville Ferguson, Board President for the Center. That’s where Sage and its generous donors stepped in. Stu Johnson of Connect Ohio, a local subsidiary of Connected Nation, made the introduction between Sage and the Center. Through its GoodTogether program – which facilitates the donation of technology to organizations in need – Sage approached several of its business clients to donate. Charles Schwab & Co., Inc, and Huntington National Bank answered the call without hesitation, providing 12 like-new desktop machines and accessories. Sage directly donated 5 LCD monitors as well. The Digital Divide (the gap between those who have access to reliable technology and those who don’t) is a pressing contemporary issue. It reflects disadvantage of all types, and entrenches cycles of disenfranchisement. But there is a solution to this problem. The 14th Street Community Center is located at 2313 17th St in Portsmouth, Ohio. Sage’s mission is to make the world more sustainable by extending the life of electronics. Sage provides IT lifecycle services to businesses large and small, helping them reduce data security risks and operational costs, and increase asset value. Through strategic asset management programs for technology redeployment, donation, resale, lease return, employee purchase, and recycling, Sage creates multi-stakeholder benefits to businesses nationwide. The Sage GoodTogether® Program supports corporate social responsibility (CSR) efforts by redirecting a portion of enterprise surplus technology to benefit a variety of social services, and reduce digital exclusion among low income Americans. For more information, call 844-4SAGESE or visit http://www.sageSE.com, http://www.SageGoodTogether.com, and shop.sageSE.com.